OpenStack has a Grafana dashboard with infrastructure metrics, including CI jobs history (failure rate, …). These dashboards are configured via YML files, hosted in the project-config repo, with the help of grafyaml. 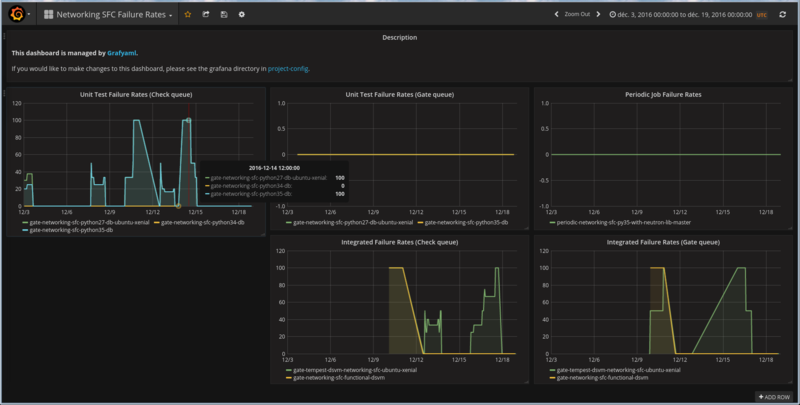 As a part of the Neutron stadium, projects like networking-sfc are expected to have a working grafana dashboard for failure rates in gates. I updated the configuration file for networking-sfc recently, but wanted to locally test these changes before sending them for review. Documentation mentions the steps with the help of puppet, but I wanted to try and configure a local test server. Here are my notes on the process! I run this on a Centos 7 VM, with some of the usual development packages already installed (git, gcc, python, pip, …). Some steps will be distribution-specific, like grafana install here. Seeing the main dashboard? Good, now open the API keys menu, and generate a key with Admin role (required as we will change the data source). The first update command will add the OpenStack graphite datasource, the second one adds the current networking-sfc dashboard (the one I wanted to update in this case). If everything went fine, refresh the grafana page, you should be able to select the Networking SFC Failure rates dashboard and see the same graphs as on the main site. But we did not set up this system just to mimick the existing dashboards, right? Now it’s time to add your modifications to the dashboard YAML file, and test them. A small tip on metrics names: if you want to be sure “stats_counts.zuul.pipeline.check.job.gate-networking-sfc-python27-db-ubuntu-xenial.FAILURE” is a correct metric, http://graphite.openstack.org is your friend! This is a web interface to the datasource, and allows you to look for metrics by exact name (Search), with some auto-completion help (Auto-completer), or browsing a full tree (Tree). Refresh your browser and you can see how your modifications worked out! Remember that this is a simple local test setup (default account, api key with admin privileges, manual configuration, …). This can be used as a base guide for a real grafana/grafyaml server, but the next steps are left as an exercise for the reader! In the meantime, I found it useful to be able to try and visualize my changes before sending the patch for review.